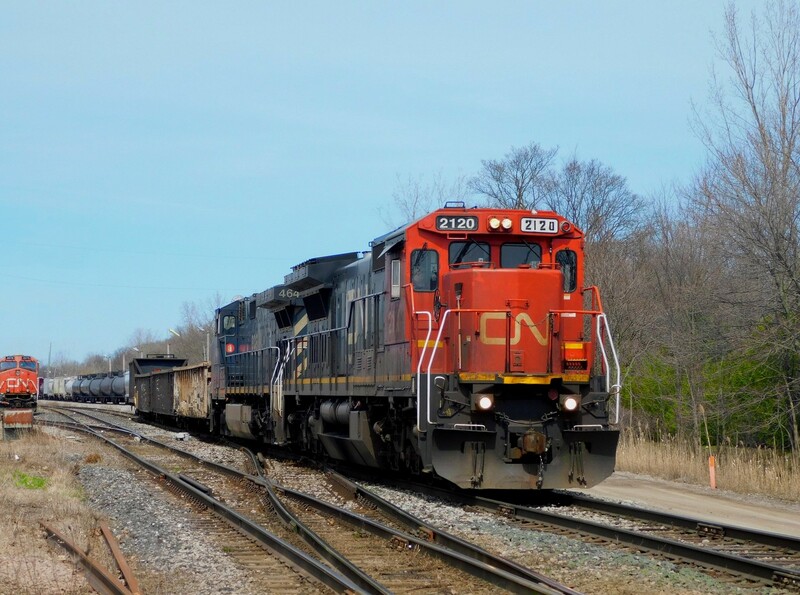 Railpictures.ca - Matthew Tozier Photo: CN C40-8 2120 and BCOL C44-9W 4649 head out of Port Robinson for headroom so they can back their train up onto the mainline and prepare for departure to Buffalo’s Seneca yard to interchange with the Buffalo & Pittsburgh Railroad. | Railpictures.ca – Canadian Railway Photography – photographie ferroviaire Canadienne. Caption: CN C40-8 2120 and BCOL C44-9W 4649 head out of Port Robinson for headroom so they can back their train up onto the mainline and prepare for departure to Buffalo's Seneca yard to interchange with the Buffalo & Pittsburgh Railroad. I see the 2120 is starting to show signs of age by the salt and pepper number boards.